I've been playing around with SpaceEngine for the last few days, and I have to say, I'm pretty blown away. It's quite amazing. But one thing I'm perhaps slightly disappointed in is the relative lack of nebulae, and the limited detail of them. For example, while there are some popular nebulae (the Ring Nebula, Orion Nebula, Eagle Nebulae, etc.) others (the Carina Nebula, Helix Nebula, Horsehead Nebula, etc.) are inexplicably missing. They're also relatively small; for example, the Orion Nebula is actually part of a much larger molecular cloud complex, but only the brightest part is shown in game. I haven't seen any dark nebulae, either. Now, of course, not every single nebula known can be included, and in reality most of them are barely visible, but it would still be nice to explore massive star forming regions or roaming clouds of dust from time to time. 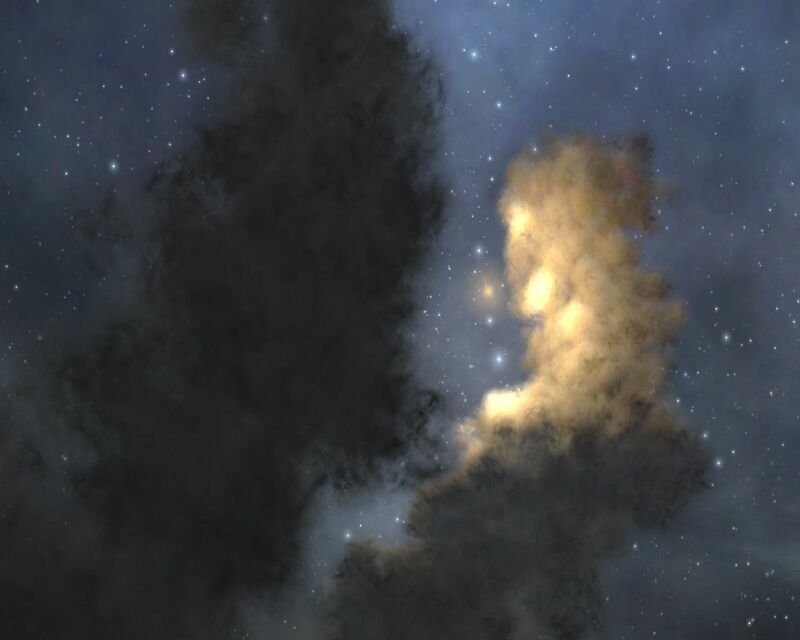 It would also be nice if they had a bit more detail than just simple clouds, as nebulae can form quite intricate structures. I think by default the Orion Nebula is located about 3 times too close to Earth (and therefore is 3 times too small). You can go into the catalog file and edit that manually if you want. I agree also that Carina should be included by default (I wanted to add it in myself but my research turned up little about its size). Concerning the lack of detail, this is still an extremely early version of the program and very much a work in progress. I'm sure SpaceEngineer will touch up upon that at some point in the future. And it still looks better than any other program I've used as it stands now. I think the thing nebulae need most is more ability to determine their shapes, and absorption particles to simulate non-excited gas and dust and give more structure to the nebula. Surfing the star forming "clouds" would be awesome. SpaceEngineer should make procedural nebulae and procedural shapes (not just a circular area), with different colors (now it's just the same old red/blue diffuse, and it's the same density throughout, no beautiful clouds. I'm sure he will add this in later versions though. I'm not so sure about making REALLY colorful nebulae... That would be a bit of a departure from reality. Reflection nebulae can be any color the star lighting them is (which is usually blue) but emission nebulae are basically only red. Planetary nebulae, on the other hand, can come in some pretty crazy colors, but typically a variation on turquoise/red. Of course, if you were actually viewing them with the naked eye up close, they'd probably all appear gray. Rendering may be speeded up by replacing alpha blending by negative blending for dust sprites (like in Infinity), but it makes it look unrealistic. Another problem is making 3D models for known nebulae. It is a very complex process, and doesn't give true results because we don't know the real 3D shape of nebulae. My main issue with current nebulae is that they seem like they're composed entirely of emmissive particles and so seem to lack "structure". Particles in the nebula that absorb light (like the abs. particles in galaxy models, especially irregular galaxies) would make the nebula seem more convincing and "structured", without really adding any additional detail or demand on hardware. Another issue is with the roughly spherical shape of all procedural diffuse nebulae, but this is less important I think. 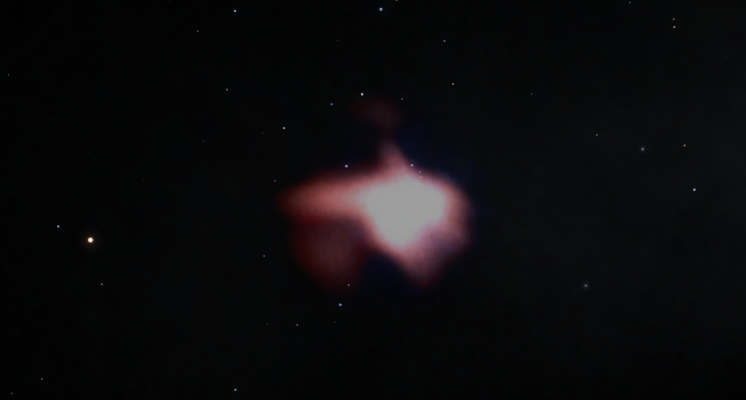 I did a test by taking the default Irr galaxy model and changing the emParticle color to a reddish hue (1.00, 0.52, 0.50) and it looked a lot more like nebulae should look (minus the billion stars inside ). May attach a pic later. Is that in space engine ?O_O that looks amazing. You can modify a default nebula script in this way. They are not in real-time, are they not? They will render into a skybox, coz in Infinity you can't do a slow interstellar flight, but only a jump between systems. It is from an old separate test. They are not real-time, isn't it? They will render into a skybox, coz in Infinity you can't do a slow interstellar flight, but only a jump between systems. It looks real time, and it doesn't look like a "skybox". How long would it take to generate something like that procedurally? If it's too long maybe just if you're close enough to barely see it start generating it in the background, then slowly make it fade it once it's fully loaded. 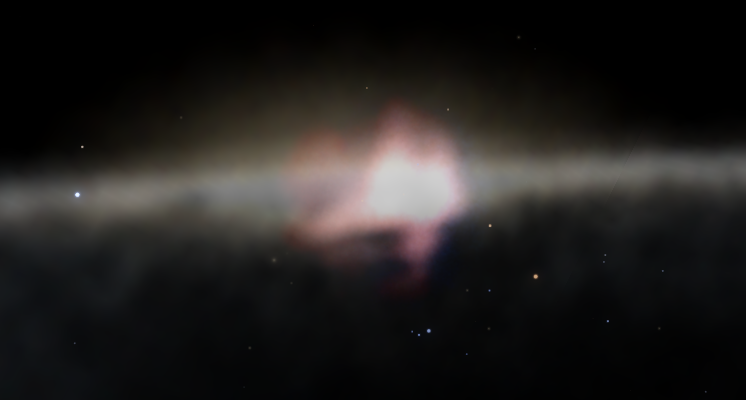 Also, if that's not possible what about procedurally shaped nebula? 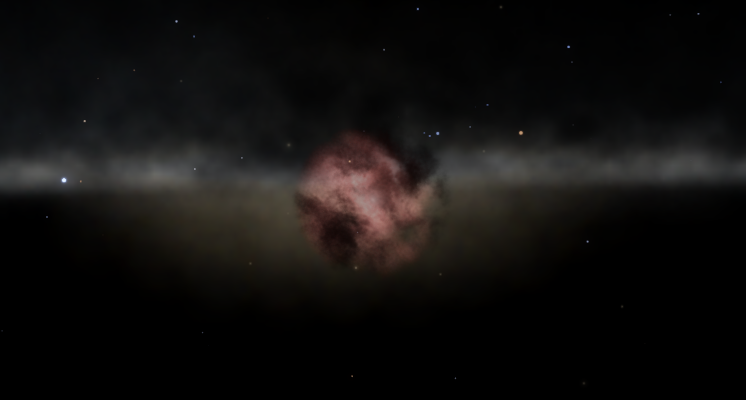 It would be neat for the diffuse nebulae to at least have a different shape then others. Man, I fell in love with those Infinity Nebula tests when they were released. You should definitely ask them for advice, SE. I tried, but I can't get the absorption particles like the galaxy has, only emmissive, with the usual red/blue colors; it seems that where there are abs particles in the galaxy model, the nebula model has no particles (or invisible particles), or perhaps replaces them with emmisive blue. They do not respond to my changing their color. Maybe I am manipulating parameters wrong, I don't know. I'll mess with it more in the future when I have more free time. There's no to make a galaxy generate no stars with the current code, is there? 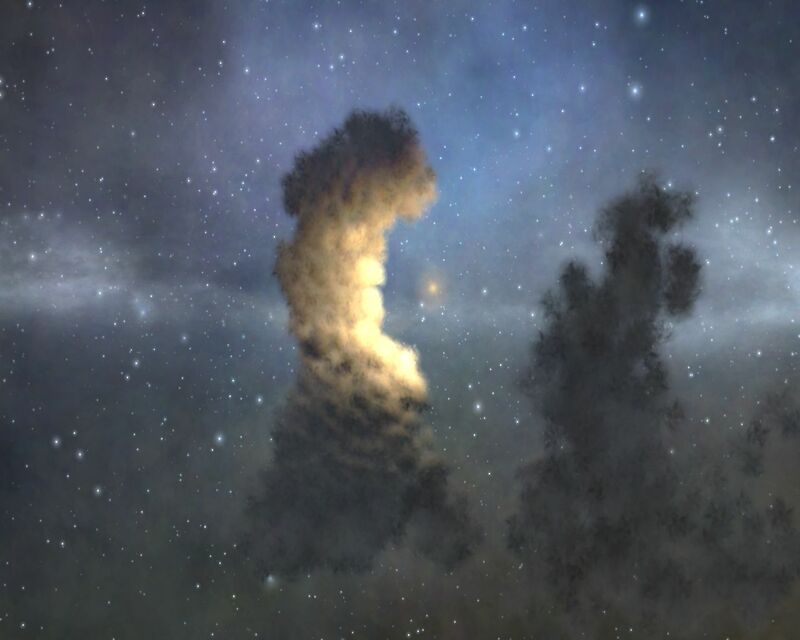 The Infinity nebulae look nice, but they aren't realistic (nothing against the Infinity dev team, I know they aren't aiming for realism). 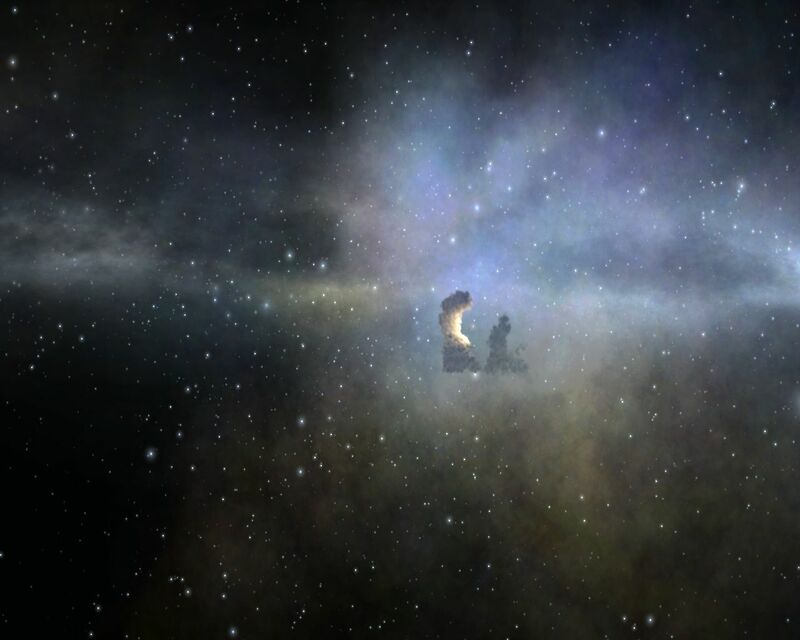 The dark parts of their nebulae look nice though, and that's the big thing that nebulae in SE are missing. They use ~1 million small additive blended particles. Additive blending doesn't require sorting of particles before rendering, but gives physically incorrect dust sprites. In SE, I use only 50-100k alpha blended particles. They require sorting before rendering, and this is the main bottleneck - sorting is a heavy operation. However, galaxies and nebulae were made 3 years ago, so modern PCs may handle 300-500k sprites now. Last but not least - 1 million sprites consumes a lot of video memory. In Infinity they can render a nebula into a skybox and free memory. In SE I can't do this. Do you delete old nebula models from the cache folder before launching SE? SE doesn't regenerate them automatically or by pressing F5 in "Edit mode", like it is done for galaxies. Do you delete old nebula models from the cache folder before launch SE? SE don't regenerate then automatically or by pressing F5 in "Edit mode", like for galaxies. It contains all necessary parameters for both diffuse nebula and irregular galaxy since I combined the codes so I just swap GalaxyModel to NebulaModel to make the two test objects. It is incorrect. To use your "Nebula" model with a nebula, you should add a new nebula to the nebula catalog and add the parameter Model "Nebula" to its script. In this case only the one nebula that you've added will use this model. If you want to modify default models, change the "Diff0", "Diff1", "Diff2" models (in data/models/nebulae/models.cfg). You can also add new models named "Diff3", "Diff4", etc - they will be randomly assigned to some procedural nebulae. 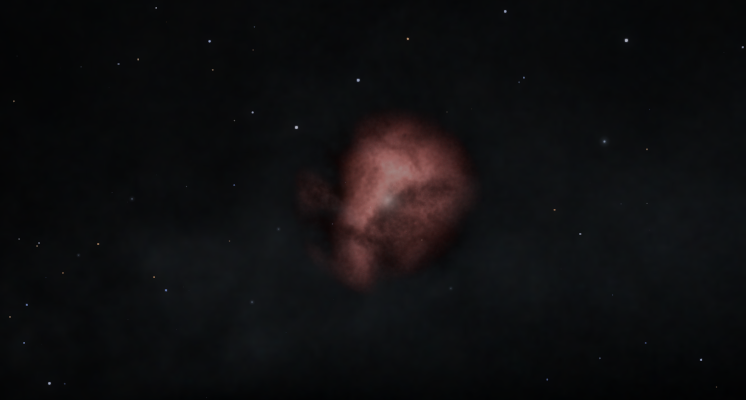 To use your "Nebula" model with a nebula, you should add a new nebula to the nebula catalog and add the parameter Model "Nebula" to its script. In this case only the one nebula that you've added will use this model. I had already done that and assigned the model to my test nebula (the one in the pictures). It was these catalog scripts and the model script that I already posted that I used to generate the test images in my earlier post. I probably should have posted these scripts with that post, but I didn't think about it. I suppose my question is: can SpaceEngine generate nebulae with absorption particles like it can for galaxies (dust lanes)? And if so, what parameters need to be specified in the model files? My goal is to get a nebula model that looks like the galaxy model I posted, and I am wondering if this is possible in the current version.